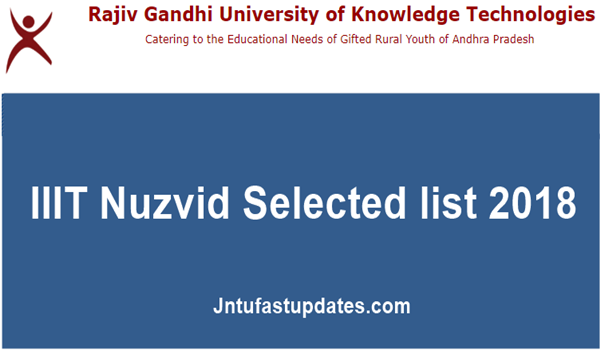 IIIT Nuzvid Selected list 2018: RGUKT Nuzvid Announced 3rd Selection List for all campuses Phase-III on 26th october at rguktn.ac.in. Rajiv Gandhi University of Knowledge Technologies (RGUKT) Nuzvid has invited online applications for Admissions to 6-Year Integrated B.Tech Programme. Huge number of candidates are applied for IIIT Nuzvid admissions for the year 2018-19. The list of provisionally selected candidates for counseling will be displayed on the University website www.rgukt.in. The candidates will also be informed by post, E-mail and SMS message, whichever possible, to the address/mobile number written in the application form. Note: The following list of applicants are Provisionally Selected for admission into the 6-Year Integrated B.Tech Programme of Rajiv Gandhi University of Knowledge Technologies (RGUKT-AP) for the Academic Year 2018-19.
a) Admissions will be based on merit in the Grade Point Average (GPA) and Grade obtained in each subject, and as per the provisions of Presidential Order, 1974.
b) Latest application will be considered in case of multiple applications. vii. Lowest random number obtained from the hall ticket number. Commencement of classes for admitted students (2018-19) at respective campuses. a) The applicants should submit a print out copy of the application along with the following documents at the time of certificate verification and Admission. The proforma for the certificates mentioned below are given in Annexures. iii. GPA of 10th class Public Examination, i.e., SSC/CBSE/ICSE/NIOS. a) If a candidate fails to submit any of the relevant certificates, he/she shall not be considered for admission. b) The candidates selected provisionally for RGUKT shall report in person for Certificate Verification and Admissions at RGUKT campuses for verification of original certificates / documents and the details provided in the application form. c) Verification of certificates and admissions in respect of candidates belonging to the Special Categories like Physically Handicapped (PH), Children of Armed Personnel (CAP), NCC and Sports will be conducted at RGUKT- Nuzvid on prescribed dates. a) Admission to the first year of 6-year integrated engineering programme in the University will be granted only after satisfactory verification and scrutiny of the details mentioned in the application and the original certificates / documents submitted by the candidate at the Certificate verification and Admission centre. Mere selection for certificate verification /documents will not guarantee admission to the candidate. c) Every student has to pay a registration fee of Rs.1,000/- (Rs.500/- for SC/ST candidates) and a refundable caution deposit of Rs.2,000 (by all), that is a total ofRs.3,000/- (Rs 2,500/- in case of SC/ST candidates) at the time of admission. Join ayyanu kani seat vastunda ani return vachasanu….. I am minority student Sir I got gpa10 in ssc exam .so I am not studying inter yet, I still hoped on seat.i am not observed that minorities getting seats, please look on us.